a blessing to the other. If I'm honest, then you would know that I've been struggling with blogging lately. Sure, I've written up some posts here and there but deep down, I've been struggling. Struggling with writer's block, struggling with jealousy and the temptation to seek revenge of sorts. It sounds terrible only because it is. Fortunately, I somehow came to terms with it all. And I give all the credit to Jesus. A few weeks ago, I was struggling with coming up with original, organic, and interesting posts for you to read. Ones that would invite conversation and dare I say, more readers, too? I was also struggling with the temptation to seek revenge. You know, the you-didn't-comment-so-now-I'm-never-going-to-visit-your-blog-again sort of thing. Okay, so that wasn't the actual reason to seek revenge, but I think you get the picture. Yeah. That was pretty much a wake-up call for me. Simply put, I was reminded that this thing called blogging is a blessing in and of itself. I mean, not many people can say that they have friends from all over the country/world who are there to encourage them and be encouraged by on a daily basis. Blogging is something that I feel I was made to do. And I believe that with blogging, comes the responsibility to be an encourager and to be open to receiving encouragement from others. The posts I write and the attitudes and opinions that I share on my blog should be that of encouragement, not revenge or jealousy. In the same way, I am also pushing myself to read blogs that do the same. And let me tell you, I've found some great ones this past year! Anyway, I guess I just wanted to say that we all want to belong and have that feeling of belonging (or am I the only one?). So are you with me, friends? 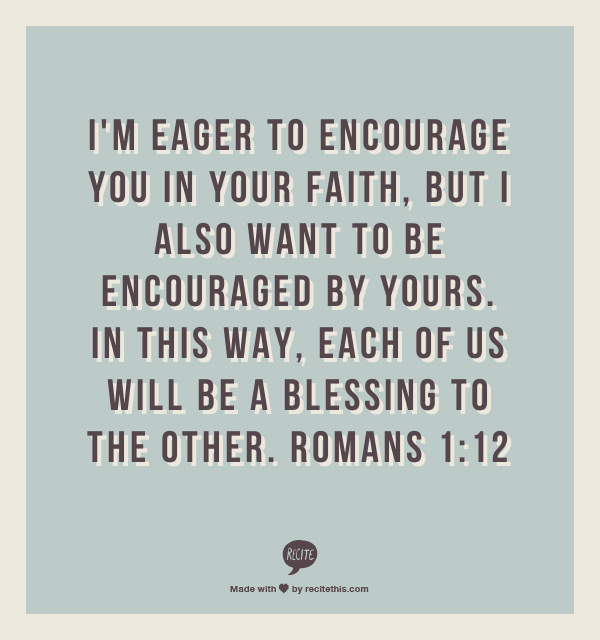 Are you ready to be an encourager and be encouraged by others? I think this will make a lovely New Year's resolution for me and one that I think I can actually keep (or at least let's all hope I can!). I love this! I've been in a rut too when it comes to blogging. Thanks for sharing. Umm, girl, you're definitely an inspiration to me! I am also so so so glad + grateful that you sent that first email that started this blogging friendship. I couldn't thank Him enough for it!